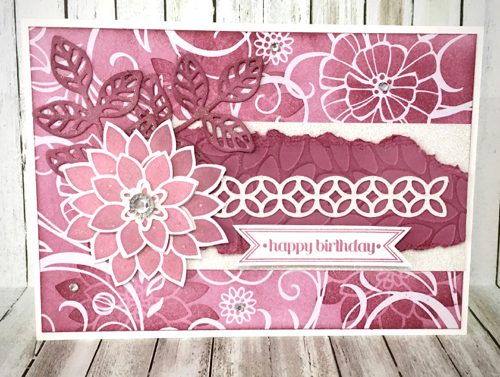 My first time at using Sweet Sugarplum - one of the current In Color inks from Stampin' Up!® and I chose to do a girly birthday card. We used The Flourishing Phrases stamp set, and the Flourishing Thinlits from Stampin' Up! and used a few different techniques to create our birthday card. They can be purchase together in a bundle and that will save you 10%, or you can purchase one or the other of them individually. They go so well together though that I think you will decide you really need them both. 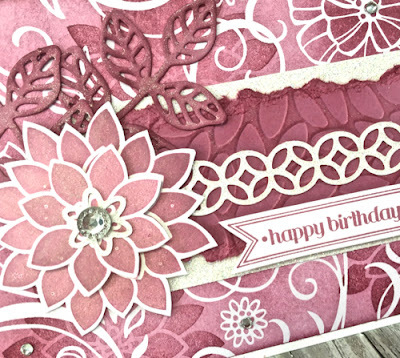 So many techniques used here starting with sponging different intensities of ink onto one of the designs from Irresistibly Floral Specialty Designer Series Paper, then randomly stamping the large flower image for Flourishing Phrases over the top of the area. This was all buffed with a tissue to bring back the resist design. Next we added a strip of Dazzling Diamonds Glimmer paper and a torn and embossed (Petal Burst Embossing folder) section of Sweet Sugarplum A4 card stock. This in turn was layered with a Dazzling Diamonds strip cut with the Flourishing Thinlits. The large flower was stamped twice and fussy cut with Paper Snips from Stampin' Up! before being layered with a dimensional. The leaves are also from the Flourishing Thinlits pack. Clear Wink of Stella has been applied to the flower, the leaves and the embossed background and together with some Rhinestone Basic Jewels, creates a lovely shimmery effect. It was lots of fun building this card and seeing the different effects depending on the amount of sponging used on the base. Everything was matted onto a Whisper White Thick card base. If you would like to join this weekly class and you live in Canberra, contact me for further details.